Take a leisurely half-day all to yourself, flipping through magazines or visiting the spa before joining your crew mid-mountain for lunch. You can swim year-round in the heated outdoor pool. Keep the conversation lively with a pack of Table Topics cards, and vote on the best (or funniest/strangest) answers. It's not easy after a day in the mountain air. Nightly s'mores in the winter, and glorious mountain views all year round. You won't have to go far to enjoy the slopes. The Steamboat gondola is just 200 feet away. Skip the shuttle lines. The resort offers ski-in/ski-out access. Rally the troops for a relaxing swim in the heated outdoor pool. 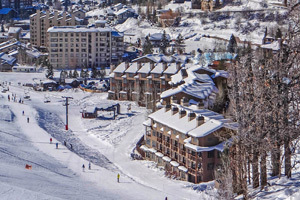 With its genius location in the Morningside Tower, Sheraton Steamboat Villas is tucked below the mountain at the base, steps from the high-speed Christie Peak chair and gondola. Gather your crew’s rental gear from the onsite shop and drop your ski-schoolers off for a day with the astoundingly patient instructors, then head up top while you’re still feeling (somewhat overly) confident. Hit a groomed black or perfect your technique on the moguls for an hour or two before meeting up with your crew for a mid-mountain lunch. Then get a few more hours in before calling it a day and making your way down. Once you collect your future Olympians or X-Gamers, join them on the lower chairs so they can show off their newfound skills for you and your GoPro, then head back to your villa. A Starwood Preferred Guest member favorite, Sheraton Steamboat Villas has been voted Best Winter Adventure – and you’ll quickly see why. You’ll find rooftop hot tubs, an outdoor heated pool, fitness center and steam room – even a game room that’s open 7 am to 11 pm. Find some time to escape to the Rocky Mountain Day Spa for a massage or daily yoga class. And if you’re lucky enough to be visiting in the summer months, take the Sheraton Shuttle to the Robert Trent Jones Jr. designed Rollingstone Ranch Golf Club – one of Colorado’s best courses. Stay for dinner at Fish Creek Grill, on the upper level of the clubhouse, with sweeping golf course and Yampa Valley views from the tables inside or out on the deck. The welcoming, tastefully styled, valley-facing residences come in a variety of floor plans, including two- or three-bedroom villas, plus a three-bedroom with mountain views. Luxe touches include jetted tubs and two-sided fireplaces, and you’ll be happy to hear the Sweet Sleeper beds live up to their name. The balcony gives you extra living space when the weather’s nice. And the full kitchen awaits your famous breakfast burritos or a cinnamon-sugary french toast bake. Overslept? Maybe save that original plan for another day, and hit the Breezeway Café instead for coffee and bakery treats. Save an evening for Sevens Restaurant or grab après ski drinks at Saddles Bar & Grill while you watch the last of the weary mountain conquerors make their way down to the base or catch big air off the terrain park rails. Plan to come back to the Saddles deck for s’mores at 8 pm sharp. Sip hot drinks around the fire pit while the kids char their marshmallows, then step in for the sandwiching step, requesting a small bite in exchange for your assembling expertise. Taking a recovery day? You’ll find plenty to do nearby. Start by strolling downtown shops like the iconic F.M. Light & Sons, where you can stock up on plaid flannel in the store that’s been “Outfittin’ the West for over 100 years.” Or check out the snow tubing at historic Howelsen Hill, one of the country’s oldest ski areas in continuous use, and the only one listed on the Colorado State Register of Historic Places. Dozens of winter Olympians have trained on its slopes and jumps. While you're downtown, check out Old Town Hot Springs, racing down the two curly slides and soothing your sore ski muscles in any of the eight natural mineral water pools. Summer offers up additional options like the Howler Alpine Slide, river sports like fly fishing and rafting, plus hiking and biking on the trails. Or seal your status as Best Vacation Planner Ever with a horse-drawn wagon ride up to dinner at a mountainside lodge.